Xylem’s Sanitaire ICEAS Advanced SBR is a continuous flow biological treatment system that provides multiple advantages versus conventional activated sludge and other SBRs by bringing together process, aeration, decanting, and control in a single treatment tank. It is fully automated and includes a completely integrated process design consisting of the aeration system, blowers, pumps, mixers, effluent decanters, monitoring and control equipment, and a comprehensive process control system. The ICEAS Advanced SBR is designed to reduce complexity of operation. Unlike conventional activated sludge plants, there is no need for primary or secondary settlement tanks or return sludge pumps. All treatment is done in a single basin. Continuous inflow distributes variations in flows and loads evenly across all basins – simplifying day-to-day operations and operational changes, as well as accommodating single basin operation for low flow and maintenance conditions. The intelligently-designed process control system with simple, intuitive, time-based control and trending capability provides a full system overview, making it easy to optimize plant performance, predict maintenance and reduce operating costs – taking the complexity out of SBRs. Xylem's ICEAS Advanced SBR can handle flows from 100 m3/day to 300,000 m3/day. Thanks to the unique basin design and actively controlled decanter, the ICEAS Advanced SBR can be designed to accommodate up to six times average daily flow while assuring high effluent quality across the entire flow range. 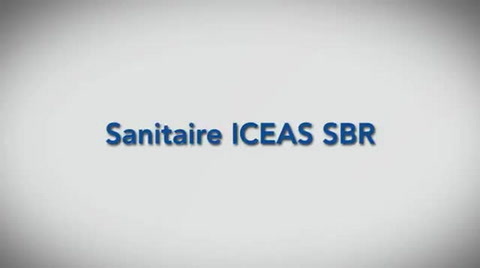 The ICEAS Advanced SBR process can also be designed to remove nitrogen and phosphorus from wastewater through biological nutrient removal (BNR) processes. Xylem's ICEAS Advanced SBR minimizes energy use by up to 50% thanks to its highly efficient aeration grids and blower technology, along with cutting edge controls and instrumentation that use innovative algorithms to control the process. Using Xylem's Sanitaire continuous inflow distribution technology, the peak load is spread across all basins -simplifying operation and saving up to 30% on the total footprint. ICEAS Advanced SBR is designed to use a small footprint. The result is reduced upfront capital expenditures thanks to less land requirements and lower civil construction costs. With almost 1,000 installations worldwide, Xylem’s experienced design team can design an optimized, flexible solution to meet both current and future requirements. Xylem's ICEAS Advanced SBR systems are also continuously optimized thanks to Xylem's OSCAR process performance optimizer. OSCAR matches the precise amount of energy consumption to the dynamic treatment need, ensuring that the right amount of energy is used. In addition, advanced features such as automated sludge age control (SIMS), ammonia control, reporting tools, and SCADA are available as well. A diverse portfolio of blower technologies are available to suit any aeration need. These reliable, energy-efficient, and easy to maintain blowers optimize diffused aeration systems. In wastewater treatment processes, aeration helps provide a healthy aerobic environment for microbial degradation of organic matter. Aeration is considered the most energy-intensive process at wastewater treatment plants consuming up to 65% of a plant’s total energy need. Xylem’s broad selection of diffusers, including membrane, ceramic and coarse bubble, have been proven over time with over 22 million units installed worldwide. Xylem’s extensive applications expertise ensures the right product selection with optimized designs. The result is systems with proven long-term reliability and the lowest total cost of ownership.